Not everyone likes or is good at bargaining or haggling for their purchases. If you fit in this category you will be pleased to know there are alternatives. Continue here to see 6 recommended travel apps to have in Bali. 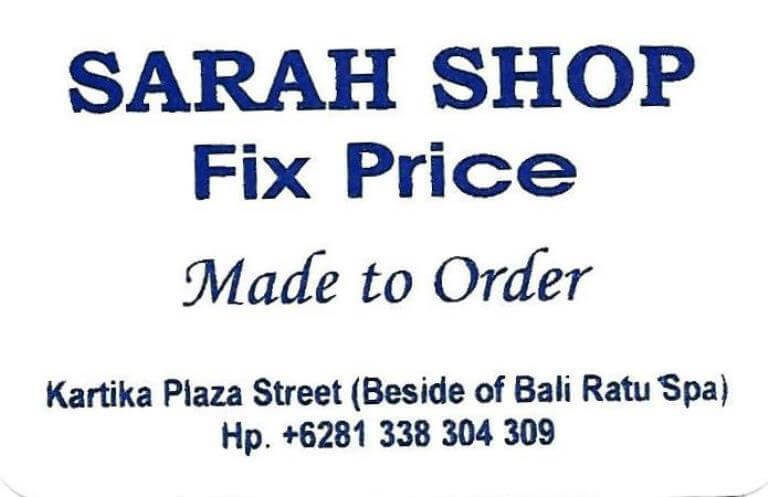 Most of the main tourist shopping areas in Bali have fixed price shops where the goods are priced at the lowest price the owner is comfortable with. These stores are a good place to visit to get an idea of what you should be paying for market type clothes, souvenirs and other touristy items. While the number of these fixed price stores is increasing, we have only listed some of the more popular ones that have earned a reputation. 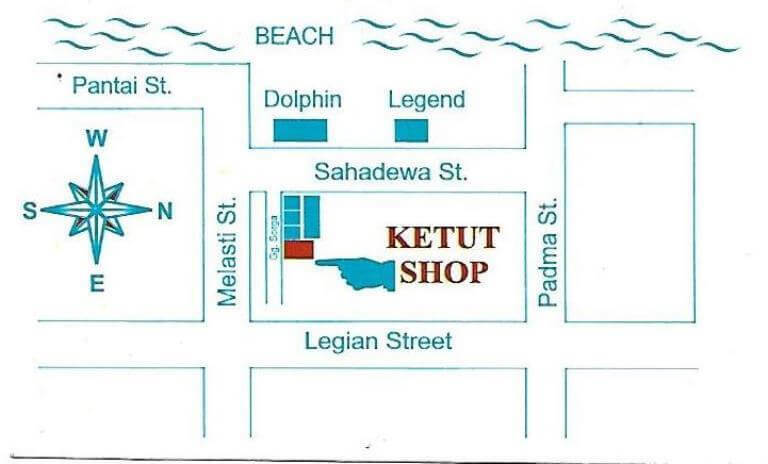 Ketut’s is probably the best known fixed price shop in the area. She does a roaring trade and you often have to queue to get served. You will be given an ice cold bottle of water for the inconvenience of waiting in line. She has expanded to 3 shops all near each other in Gang Sorga off Jl Sahadewa or better known as Garlic Lane. Her prices are low and she carries larger sizes. 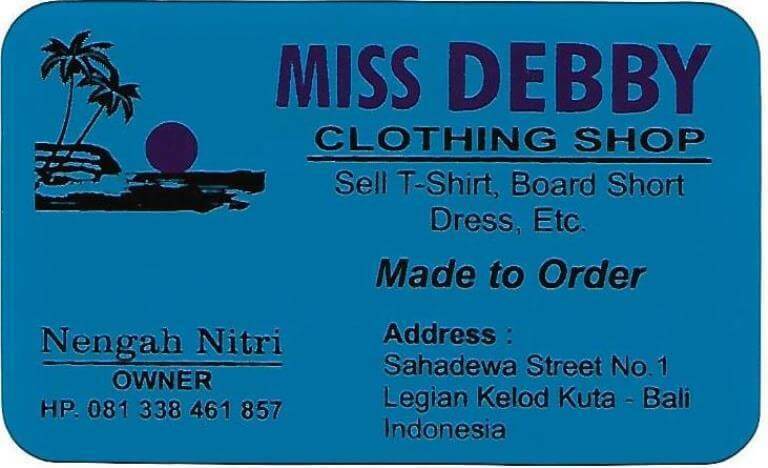 Miss Debby shop is located also in Jl Sahadewa and is close to the Melasti end. She has a very large shop behind the shopfronts as well. Just ask how to get there. She has a good range of cushion covers as well as the usual market type items and clothes. 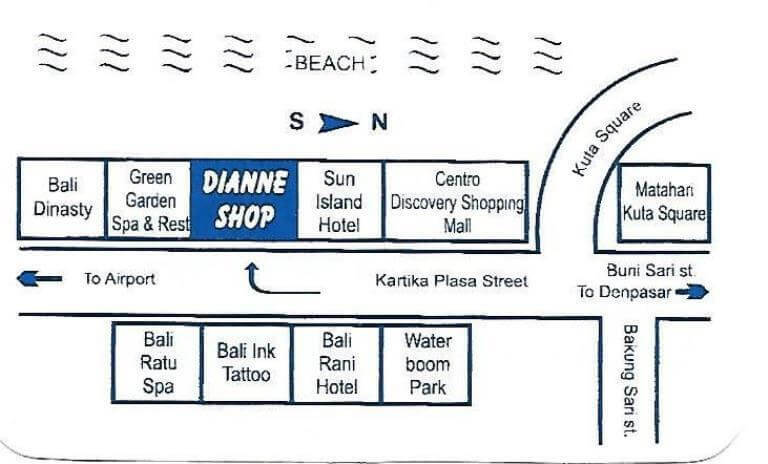 Dianne shop is near the Sun Island Hotel on Jl Kartika Pl. This shop sells mainly clothing and while it used to be good value, it lately has become a bit over priced compared to other fixed price shops. 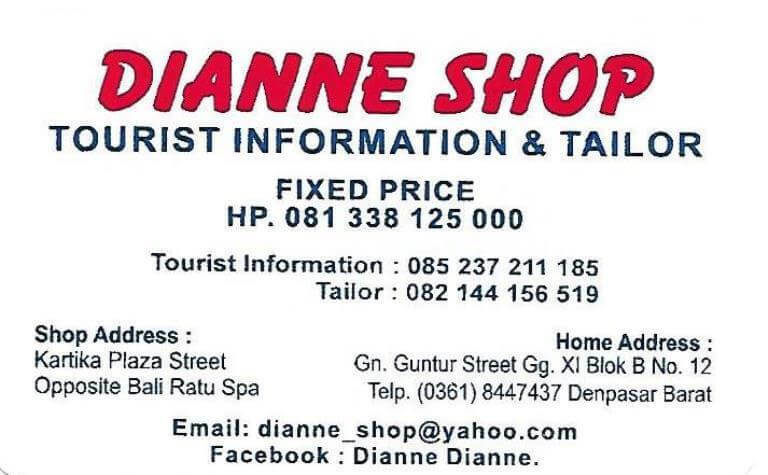 An example is a dress sells at Rp 50,000 in Sanur, same dress in Garlic Lane is Rp 60,000 and at Dianne shop is Rp 80,000. 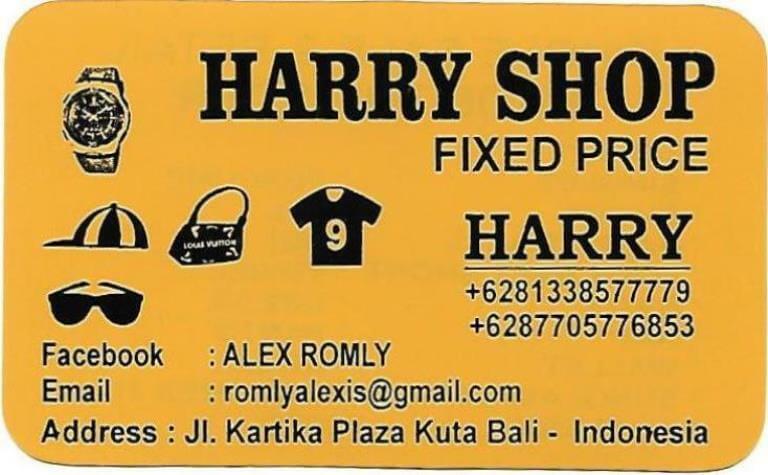 Harry Shop is also on Jl Kartika Plaza and opposite Bali Ratu Spa. 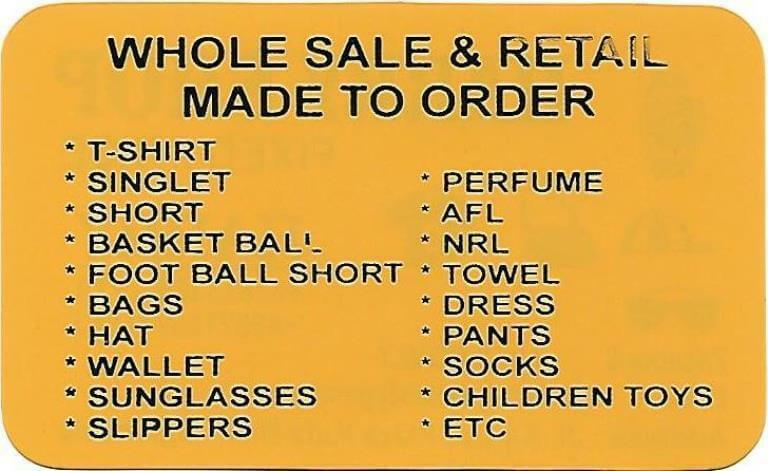 This shop carries a good range of runners as well as other goods and even though it is fixed price, it is certainly not cheap fixed price. 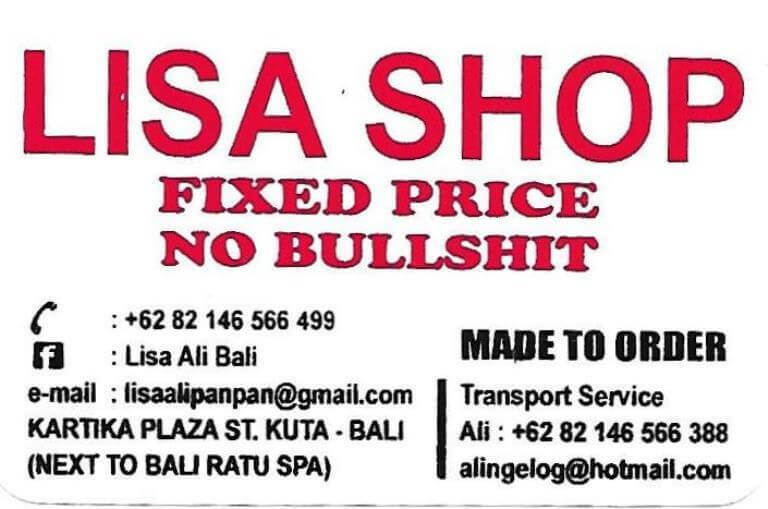 Lisa shop is next to Bali Ratu Spa and carries a good range of market style items and clothes. Friendly staff with a good sense of humour. Very good prices at this shop. 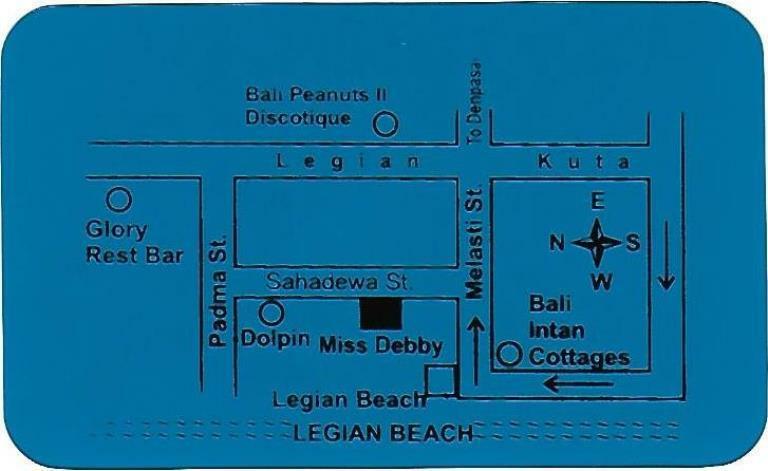 Sarah is next to Bali Ratu Spa and behind Lisa Shop. She has a very good range of women’s clothing at bargain basement prices. Friendly service and goes overboard to please her customers. 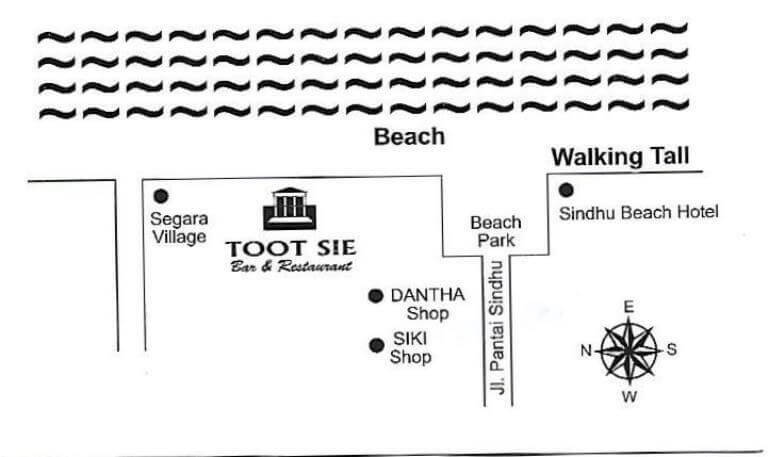 Located at Pantai Sindhu at the Baruna Beach Markets behind Tootsie Café. 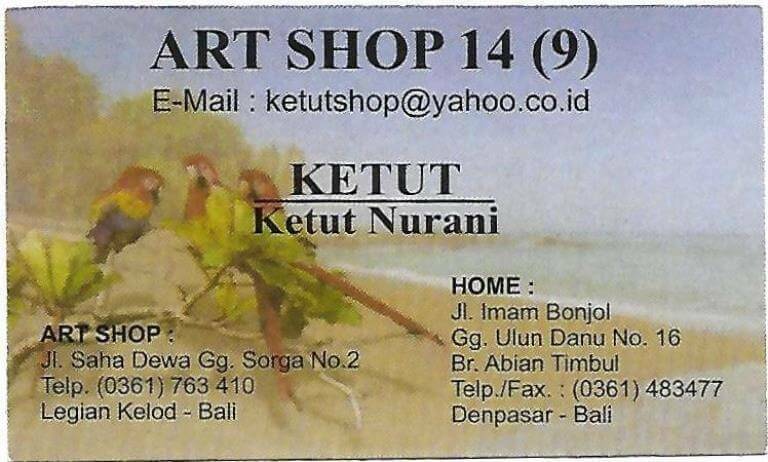 Better quality that you will see at Kuta/Legian markets. Bags, handbags, wallets, T shirts, shorts, cushion covers, runners, sunglasses etc. 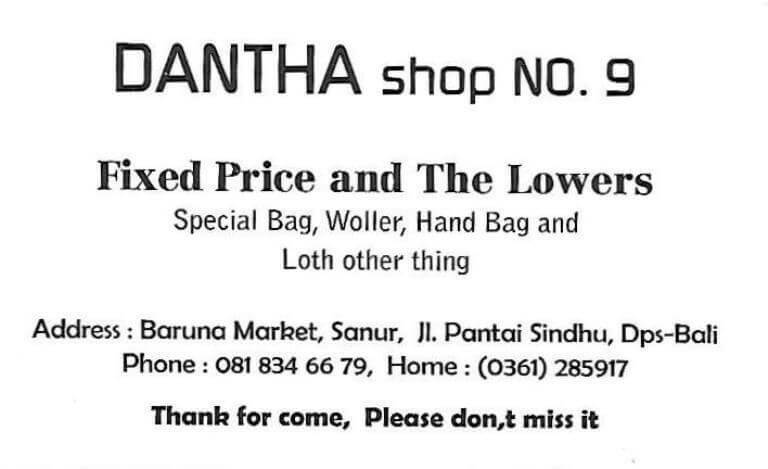 Dantha is at the Baruna Beach Markets. 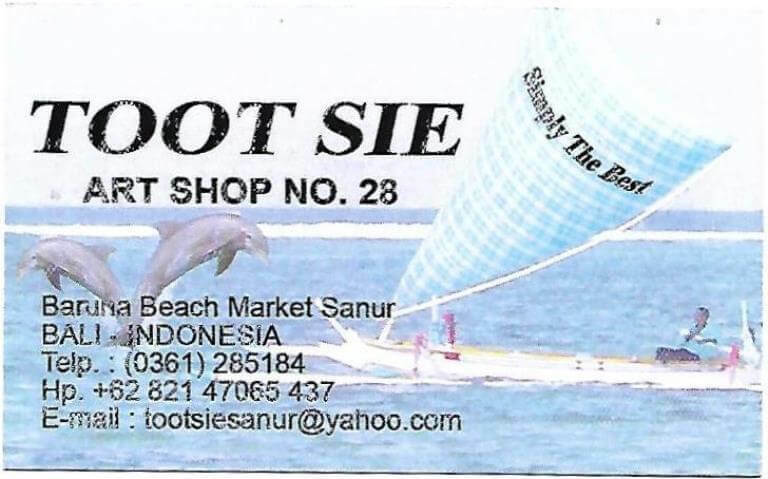 Their lines are similar to Tootsie but they mainly specialise in bags, handbags and wallets. 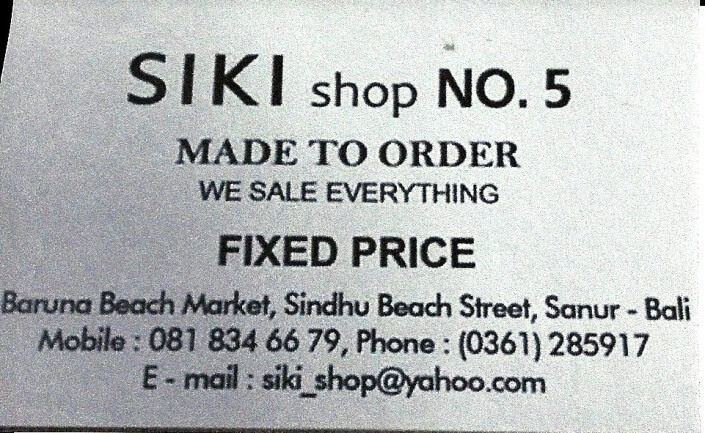 Another fixed price shop at Baruna Beach Market. Runners, clothing, bags, mandala beach towels, good range of other beach towels as well. 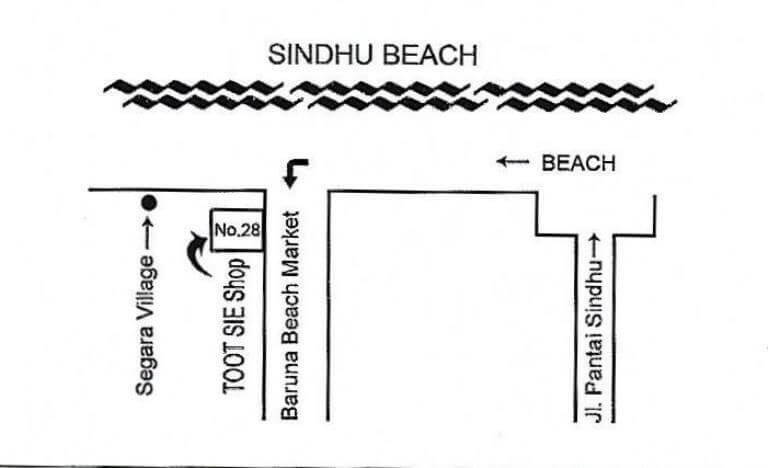 You will find Jeny Shop at Sindhu Beach Markets shop No 29 behind Benno’s. The usual clothing, bags, runners, thongs, jewelry and souvenirs.